Hannah Luxton and Julie F Hill explore contemporary notions of the sublime: the human capacity of feeling when presented with the vastness, obscurity and the terror of the unknown, subsumed into awe when seen from the safe distance of the viewer’s perspective. Through photography, painting and sculpture, the artists explore the sublime’s origins in 18th Century Romanticism to its contemporary manifestations in the technological and scientific. Specifically, they locate it in the unknowns of astronomical and geological deep space and time, from the darkness of interstellar space, punctuated with craggy mountains of cold gas and dust, to pitch dark ice caves, otherworldly glacial plains and the depths of earth’s molten chasms. 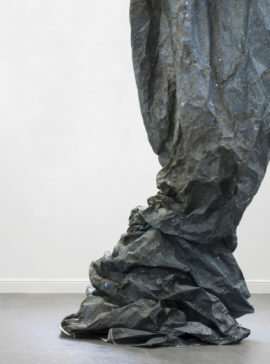 Together their works open an imaginative engagement with scales and orders beyond the human. Hannah Luxton is inspired by the Romantic notion that the divine is located within raw nature. Lifting organic and ethereal subjects from the natural world. 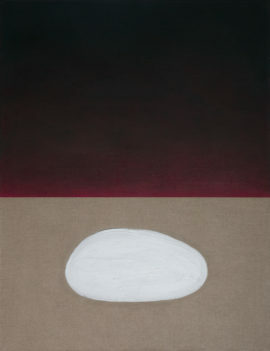 Her minimalist language of motifs offer an emotive core that is elemental, yet fragile and fleeting. Luxton’s uses naked linen to give substance to the ‘nothingness’ in her paintings, which she believes to be full of energy and light. 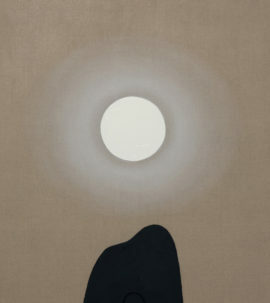 Luxton’s paintings are dreamlike; they slow time and elude direct interpretation, but in fact present more truths. Just as black holes warp time, so too can painting possess the power to defy the limits of the way we see and process the world day-to-day. In their ambiguity, Luxton’s paintings seek to activate imagination ̶ and through imagination we are capable of so much more because the boundaries of our reality don’t exist. Responding to the vastness of nature as represented by modern science, Julie F Hill employs an expanded approach to photography and image making, creating sculptural installations that explore conceptions of deep-space and cosmological time. The astronomical image is shaped into formations that resemble uncanny meteorological or geological phenomena, creating immensities that we can walk amongst, and enter into. Enigmatic and illusory materials such as mirror act as conduits or portals, inviting us to cross a threshold to experience the unknowable. Through such environments she questions scientific images and the technologies used to construct them. 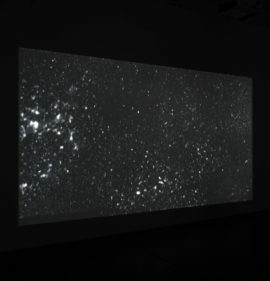 Her work Through Machine & Darkness uses Artificial Intelligence trained on RAW images from Hubble Space Telescope to create an immersive video installation that oscillates between the human, celestial and technological timescales, contemplating how technology acts as a mirror through which we try to comprehend the universe. Her large-scale, site-responsive works – such as Dark River which uses one of the largest images ever taken of the Milky Way’s central areas – create intimate experiences of cosmic immensity, tinged with science-fiction and horror.